The smug self-congratulatory sort of attitude of the Yankee Doodles are back. Now we all know the reason for the word conceited. Even though the Americans lost the war and Southern Vietnam became communist they still cannot help saying how �great the war was to them. It could be a little more objective than this but when the pride of a superpower is threatened all stops are made to make sure the Americans looked good. 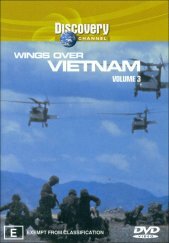 According to the makers of the Wings over Vietnam they did a remarkable job in its attempt to stop the spread of Communism. The technology was very technologically superior, sure but hey guys, this did not stop the war from being a disaster. The first chapter was mainly about the gunships put to work to provide air support for the Allied infantry. In the face of scepticism for armed helicopters they were developed and were moderately effective in suppressing the enemy occupation of key strategic locations. The gunship was equipped with rockets and a movable machine gun and a 40-millimetre canon. All used for different situations. This chapter was a good representation of the conflict as it was from the airforce�s point of view. There is a bit about the psychology and soul-searching moments that the airforce pilots had to face. When the pilots came out of training and were put into battle they found themselves enjoying being in the war. This ironic belief could potentially be soul destroying and consequently lead to hesitation. But that aside this chapter was one of the better chapters entertainment wise. The gunships sure look deadly and it does have an effect on the viewer in a propaganda kind of way. Which is the biggest downfall of the series. Who does not feel like getting behind the gun turret of a go go bird after seeing these machines at work? The second chapter was based mostly around smaller helicopters the Huey�s and their air support for ground forces. This was known as the Cavalry who was formed in the latter stages of the war. The Cavalry was also concocted to provide quick response to outnumbered troops throughout Vietnam. The common issue with much film literature about these wars is that they are making money out of the footage taken during the war of people being killed. How in the hell are we supposed to create peace by dropping 500 bombs on top of people. The Americans were doing this to stop the domino effect of communism taking over the rest of the world. It was a war that did not have a great deal of rational thought behind the instigation of it and more towards the mentality of fear and traces of communist witch-hunts of earlier times. Overall this series is ok from an American perspective the highlights are construed to make war look fun and exciting. This obviously not being a good thing. The war stories by some of the veterans are interesting and its obvious the smarter men got out alive. The rapport between the airmen and the infantry was unparalleled and even though 22 percent of All-American aircraft were destroyed, this doco makes them look real heroic.